Transparency. It is seemingly the stuff that strong relationships are made of and what many couples strive to have with each other. Complete and total honesty in every situation no matter what. 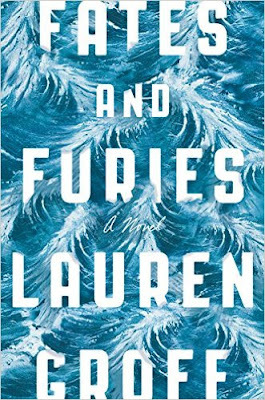 Lauren Groff's novel, Fates and Furies, flips this ideal on its side entirely. Told first from the perspective of Lotto Satterwhite and then later from his wife, Mathilde, Fates and Furies shows the reader both sides of the marriage coin and how two people who have spent the better part of their lives together can have completely different perspectives of life, love and success. Lauren Groff has produced an incredible novel about the complexity of marriage, highlighting that different backgrounds and experiences can lead to entirely opposite opinions of the same situation. The first half of the book, Fates, is told entirely from the perspective of the husband. I found him to be whiney, self centered and dull. A failed actor, turned remarkably successful playwright who takes sole credit as the creative genius of the household, Lotto continually disappointed me with his simplicity and predictability. In my opinion his half of the book is monotonous and I found myself annoyed with his constant need for validation. He holds Mathilde to the highest of standards, placing her on an impossible pedestal. In many ways I felt that his view of Mathilde would likely set him up for heartbreak, as no human can stand up to the level of perfection he saw in his wife. Furies is the second act of this novel and it's worth every star and a standing ovation. Reader, please slog your way through Fates just so that you can get to this part. From Mathilde's point of view we learn that Lotto's truths are no where the same as his wife's. That fate is no more than the secrets she keeps. Without giving too much away I would like to say that Mathilde is the more dynamic character of the two and is incredibly complex. Her narrative is what makes the book great. This novel is not for everyone. It is beautifully written but at times overbearingly pretentious with its flowery prose and mythological references. The first half has excruciatingly slow moments that could turn many readers away but if you can, hang in there. The second half of this book is where the big payout is and it's worth every word.